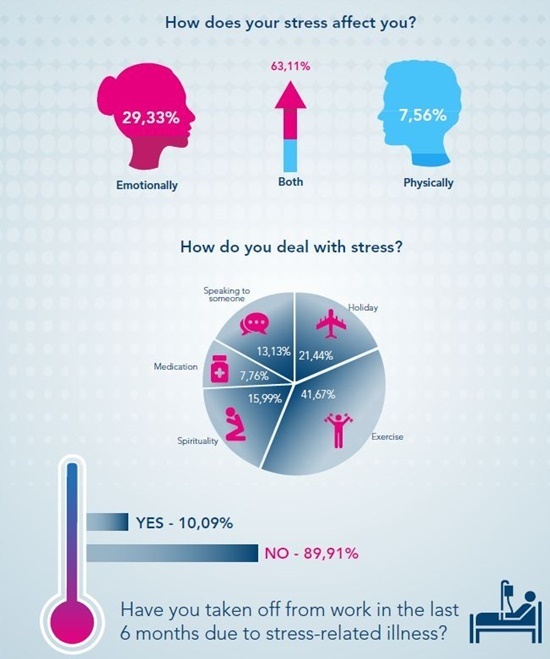 Cape Town - Work stress remains one of the largest health problems among South African professionals, according to the 2017 Profmed Stress Index. The index is compiled from a survey of nearly 3 000 of Profmed’s professional membership base. The majority of respondents are between the ages of 25 and 34, while the second largest group of respondents are between 35 and 44. The majority of respondents work in the medical industry. It reveals that, apart from financial stresses, 45.5% of respondents still saw work as the biggest contributor to stress in their lives. About 21.44% of respondents coped with stress by taking time off from work or going on holiday. “Finding effective ways to manage stress is what will make the difference in the quality of life for hard-working professionals, and is the only way to avoid falling ill to stress-related illnesses,” Profmed CEO Graham Anderson said in a statement issued on Thursday. About 10.09% of respondents indicated that they have taken time off from work due to stress-related illnesses over the past six months. This is a slight increase from the previous year’s rating of 9.7%. Another area of concern is the increase in the number of professionals who indicated that they feel they are not been managing stress effectively. 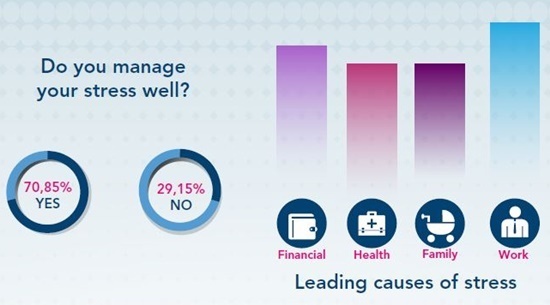 In the latest survey 29.15% of respondents said they are not managing stress. This is up from 28.3% the previous year. This could be because of inflation and financial pressures, poor financial planning or debt management or lifestyle choices that don’t promote good health, according to Anderson. “Managing your stress plays a very important role in avoiding many diseases which could have severe implications on your health going forward. We strongly encourage people to learn more about the effects of stress and how to effectively manage them,” he emphasised. At the same time, he found it encouraging to see that exercise remains the most common method of dealing with stress. Respondents actively exercising to deal with stress had increased from 37.6% in 2016 to 41.67% in 2017. “Exercise not only improves your physical wellbeing, but also your mental health. Studies have shown that exercise releases endorphins, which increases levels of focus and improves your sleep, all of which gives you a greater sense of control over your life,” explained Anderson.